Aside from ending the day as a married couple, what’s most important to you and your fiancé for your wedding? If you want to let go of the details so you can relax and enjoy your Charleston wedding, you need local professionals that care about you. We will work tirelessly to ensure you are able to relish every moment and concentrate on making memories that will last a lifetime. Members of the WildFlowers Inc. Coordination Team are extensively versed in so many differing aspects of the wedding industry. A “Perfect” Day is not only cliché it is statistically unlikely. Who will handle the things that go wrong? With a smile, WildFlowers Inc. will put out the fires you never even knew started. We know how to be meticulous with the particulars that count, but not so serious that no one has a good time. We have a variety of packages available for almost every type of Bride, whether you’re a do-it-yourself wedding planning machine or you truly need expert guidance to guide you through the home stretch. Comprehensive Calla – Partial Planning: (This is our most popular Wedding Coordination Package) You have your venue and are ready to let professionals guide you the rest of the way. This is a value packed partial planning package that feels like full service! $1850 More info on the Comprehensive Calla Coordination Package. Destination Dahlia – Partial Planning Plus! 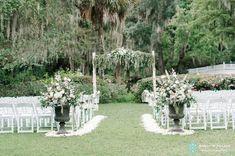 : You do not live in Charleston (or most of your wedding party or guests are from out of town). You need special guidance choosing vendors or tending to the needs of out of town guests (such as room blocks, transportation & more!). $2250 More info on the Destination Dahlia Coordination Package. comprehensive coordination & planning clients!